Alex has Extracts battle of the Dongas on Tape Three. It’s Pok again resuming my sporadic diary of events. Been in London working as steward at the Drome, earning money to pay Dave at Mandala enough for me to finish the album ROCK ‘N’ ROLL PROPHESY. And with some of the money i also ended up in Switzerland seeing friends and experiencing the forbidden protest aagainst the yearly World Economic Forum (W.E.F.) globalisation conference in Davos skiing village. This was a whole story, and when I got back i found that the Dada movement, cited as major influence on punk, was started at the Caberet Voltaire nightclub in the city i had just left, Zurich. Since i have been writing this journal here and there i have been making this new style old style rock n roll music because i am tired of people chattering whe youre delivering your sounds because you are eco-friendly, and play acoustic cheesegraters. So im developing hopefully pretty scary music, which has leaked out here and there in the past year and a bit. This new album features songs that Warp goers may remember from our sets then, which were acoustical. Now i often use an electric band, which i wont try to describe. Both Rhymer and Inamorata feature stories with the songs which was the format for early Goat performances around fires at sacred and/or threatened places during 1993-5, before we joined Mandala. There are also a lot of other bits and pieces of unreleased material that could even make 2 or 3 albums of old style and related songs. That’s the Virtual Spacegoats, alive and well in the digital realm. So you can hear old and new goatee sounds, hope it does ya good. Stumbling about due to various demogorgans lassooing me and dangling me over one of my abysses. However, IT@S COMING oh yeah….the Warp really fucked my spirit for all that up music and love , such a promising idea, but I just became sad and weary because we coulnt really play effectivly in the techno-conditions and I dont think the owners gave a damn for us. (Editor’s note from the future: Pok was actually wrong here, the owner is a lovely bloke and a year later there is an excellent and motley crewe keeping the Drome going… Exept as of March 2001 it has been evicted by the owners, Railtrack) So I have been brooding the new one and having plenty technical difficulties. So I took a few festies off later summer and have been chanting away and seeded some new ones. Mr Free Rob Cannabis has put money up for recording a song of mine, “Smokescreen”, which is about cannabis prohibition and its many uses. I have asked Grant Showbiz rto produce it , which is cool because he wants to and he does Billy Bragg and did Gong. THink I m somewehere in between the two. Billy does Woodie Guthrie songs now, he is allowed to by Nora Guthrie and that means alot to me. My new songs, starting with Smokescreen are what I call infornmation songs, moving on from pixies one could say, but I know they have not gone away, merely changing shapes. Good production needs good PROMOTION, and the likes of me and Rob will be coming up with some angles and with a little magic and contacts, who knows. It would be nice if an earth voice or two could be heard clearly. Hello, Pok here, it is February 17th 2000. Tomorrow we’re going up to the the new Warp, now calling itself the RAVELATION EXPERIENCE at : Open , 144 Charing Cross road W1, London, 10pm Friday till 10pm Saturday . £ 15, (£10 concs) £8 from 5am, £5 all day Sat. …..FORTNIGHTLY from Friday 18th Feb, Fullmoon!!! George has just quarbled with the computer and come up with this file. So here I am putting this in it. In the early 90s I heard a man with an angel voice, Jeremy his name, who sang in a field upon the bare skin of mother earth a song that answered a question that my life was asking… where does it come from this SSOund? There and then I knew the answer, or to say, found it. Tina sat on an old elegantly scruffy sofa in same field , Johnny ‘Arris arms wide as his smile, walking down the sunny land his guitar hanging on him ready for transformations. Too many moments to write down…these above from 1992, before Spacegoats came together. That is the band we made in a crop circle later that year. I had bought a mandolin and that changed most things. Became some of who I am, found the science of enhurument and had a jolly good time. Now in 200 we have gone through many changes, urbanised our self to a certain degree and are extending our musiclove into the Babylon place. The media tends to buzz about intentfully at many of the places we find ourselves, but has not done us any particular favours, but a recent appearance on Ali G is providing opportunities to be even better tarts than we have been. With a new team we are setting out to once more enhuru the planet. A fantastic poetry evening Saturday Night at the Tribal Voices campfire at Small World Spring Festival. This has been copy and pasted, most of the links and images dont work yet…. www.dicenews.com/tv is a new homepage for tribal voices – easier to quote down the phone! ‘The Gathering’ – the new double album tape has been mixed. We’re flat out with loads of work – designing the cover – tracking down potential funding, watching videos, organising more tapes, editing audio stuff and sorting out advertising. the Tribal Voices Recording Camp was held in September 1997 at Coombe Farm in Devon. It was a great success; we managed to accommodate, feed and record over 150 artists over the 10 days. most of the interviews filmed at the camp need redoing. Computer editing gear could cost around £3,500 anyone got any spare cash, or know of any equipment we can use..
‘The Gathering’ the new double album tape has been mixed. We are in the process of designing the cover, only one artist has sent cover artwork (thank you Sophie! ), if you have any artwork to contribute send it to Vicki NOW! the Tribal Voices Recording Camp was held in September 1997 at Coombe Farm in Devon. It was a great success; we managed to accommodate, feed and record over 150 artists over the 10 days. A big thank you to all of you for your help. Those who didn’t make it – Sorry you missed out on the most positive and creative camp of the year. 60 tracks of music were recorded in the studio, and 9 hours of music recorded around the camp by Chris Troth. The process was held up by the unfortunate purchase of a dodgy batch of BASF DCC tapes, a lot of time has been spent transferring the recordings onto more manageable tapes, this will enable us to have a backup should we have further problems. The Poster – There is a colour poster available to promote tapes 1&2, if you’d like one contact Clive & Chrissie. If anyone knows of somewhere to get laminating done cheaply contact them as well. Dragon Village Glastonbury Festival 1998 – We have the green light for a collective alternative space – stage, workshops, food, craft stalls, slide shows, displays, crèche etc. Yip, Yip, Yip! It will be a central field in the low impact area – this means no vehicles at all. Buddhafield Festival (15th to 19th July) and the Big Green Gathering (29th July to 2nd August) both want us to set up Tribal Voice spaces. 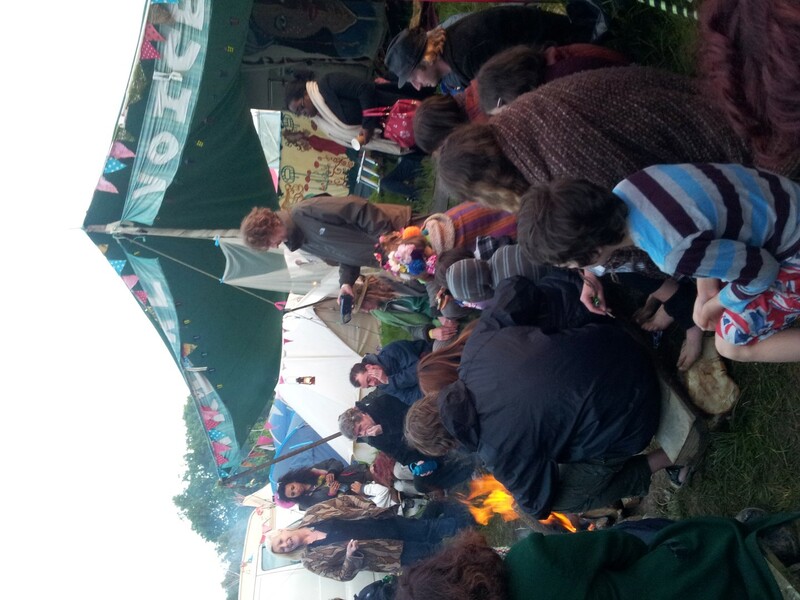 Laura is co-ordinating a Storytelling Lodge at the Big Green Gathering and the Buddhafield Festival this year. You’re all welcome to come along and tell stories or listen to others. Max and Raven bought along their video cameras and kindly shot a lot of footage in the studio and around the camp. Also Ingrid filmed some interviews. We have around 20 hours of film so far – we would like to do more interviews over the next couple of months. We feel it is time we made our own stand in the media, and want to collect some action footage of the protest camps of the last 5 years to help tell the whole film story – please get in touch with us if you know of anyone with suitable footage. The Film The Network for Social Change gave us (Polarkin) £500 towards a video camera. Clive and Chrissie then spent 6 months applying for grants for video editing equipment, office space and running costs. Unfortunately we were turned down for being “too politically sensitive”. The film project is now being put on hold while Clive and Chrissie concentrate on the Crystal Palace Campaign and other projects. At the camp, several of us discussed the idea of combining storytelling and music into a tape and perhaps a book, for children of all ages. Anyone who has ideas for tales in whatever form – interesting sounds, bare bones of stories, words and pictures, story making techniques etc. Please bring them along to the January meet, where we could find some space to share them. If you can’t make it, send them to ‘Spider’s Web’, Gerway Farm (same address as Jonno’s above). Anyone who has released 3 or more songs/ music is eligible to join PRS as a lifetime member. It costs £50 to join, you register all the songs/music you’ve written/part written and they collect royalties on your behalf every time you perform at a large venue/festival, or your tracks are played on radio/TV. For those of you who perform regularly on large stages at Glastonbury it is well worthwhile. Several tracks on TV1 & 2 have been played regularly on Japanese Radio, through Dave Goodman’s New Age Radio Show: Selena, Flora, Dongas and Feth. Phone PRS on 0171 580 5544 to ask for an application form, applications go before a board meeting once a year and take a few months to process. It all happened in January at the Future Earth centre in Chingford, London. A big thank you to everyone there for making us so welcome. Not only did we have a great time catching up with everyone, but we even managed to have a couple of meetings (wondrously facilitated by Melski). Lots and lots of notes were made, which would have cost a fortune to print out in their totality, so I have synthesised them down into the mission statement on the front page of the site. Did you protest at Twyford Down? If so you can help write a book about what happened. We want your memories, poems, music, stories, artwork and photographs. We are particularly short of photographs from 1992 before Yellow Wednesday. Maya (from Heathens All) and Paul Gill (previously solo) have teamed up in a duo. Their songwriting is powerful, evocative and at times humorous, and they have two of the strongest and sweetest voices you will ever hear. Look out for them on the festival circuit this year. Paul Gill‘s Tape(umm…that is of course the artist formerly known as Busker Paul!) will be available from the 10th of May. They are £6 each including p&p and can be ordered from Paul at: End Cottage, Wood Green Long Stratton, Norfolk. The Invisible Opera Company of Tibet claim to play Tantric Love Music, an evolutionary catalytic converter co-creating infusions of world groove, rooted deep in Heart Song; Mantric Funk; Shamanic Pop; Devotional Punk; Left-Field Acid Jazz; Eccentric English Folk and Skunk Rock. They made their debut on the Golden Moon Stage at the Big Green Gathering last year and got everyone singing along like Krishnas on Ecstasy. Don’t miss ’em. They’ll be releasing a studio album in December. Seize the Day formed at Newbury Road Protest Camp in 1996. Their songs are on contemporary themes such as roadbuilding, genetic engineering and environmental protest. They will be performing their particular brand of bold beautiful frontline folk at events including Glastonbury Festival, the Big Green Gathering, Ely Folk Weekend and Blandford Festival. “They express sentiments others only feel about cruelty, environmental destruction and social injustice. And they do it with energy and humour.” Ponterdawe Festival ’97. Feisty Dinner Lady Mrs Mop is on a mission to find out about the food in her kitchen. Hypnotised and confused by big words and big business, she is determined to find out what is best for her children and for generations to come. You will encounter the mysterious worlds of genetic engineering and agro-industry, where strange vegetables come to life and Dr Clone conducts his haphazard experiments, with songs and dances along the way! Will we find out the truth? How can YOU help make Mrs Mop’s Medicine? June 27th Glastonbury Festival. Carnival Procession with the genetic engineering network and others. July 30th – Aug 1st The Big Green Gathering, near Warminster, Wiltshire. Includes participatory workshops.